Benefits Your life's ambitions should not be inhibited by physical fatigue or mental exhaustion. Unicity Matcha aims to energize your body and mind, giving you the vitality and clarity you need to fully experience life. This carefully selected, ceremonial-grade Japanese Chi-Oka Matcha is rich in antioxidants and other vital nutrients. It's formulated to increase energy and mental concentration, as well as burn fat. 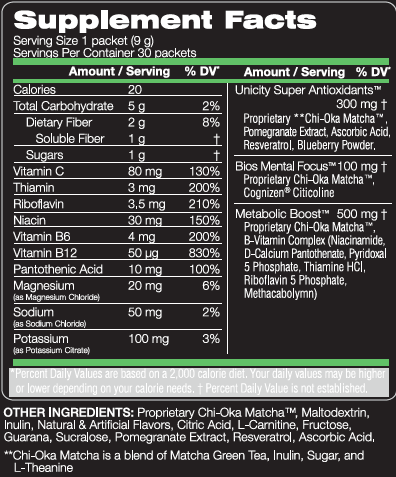 Matcha for Natural Energy has additional benefits for enhanced energy. 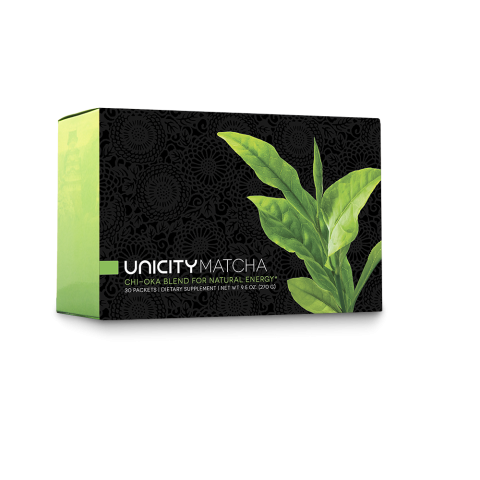 UNICITY MATCHA for Natural Energy is a refreshing blend of natural ingredients that boosts energy and concentration, lowers stress levels, and increases the metabolism. Matcha’s principle ingredient is ceremonial grade Chi-Oka Matcha, a shade-grown, hand harvested green tea from Japan, which delivers a powerful dose of antioxidants in each serving. Mix 1 packet with 8 to 10 ounces of water. Shake or stir vigorously. Serve with ice if desired.